KAILUA-KONA, Hawaii » Marine biologist Carol Cozzi-Schmarr’s business is saving some of the planet’s most exotic small sea creatures. In 1998 she and her husband, Craig Schmarr, left shrimp hatchery jobs in Florida and used a small-business loan to establish the only sea-horse farm in the country. Now they have 40 huge royal blue tanks teeming with the colorful marine animals that have a far better chance of survival in captivity than in the open ocean and sell for up to $300 apiece. Male sea horses bear the young, and strictly monogamous sea-horse couples can have up to 1,800 offspring in a brood. Yet, sea horses are disappearing from the world’s oceans. “This is a labor of love and is not making lots of money, but we’re kind of trying to do something a little different,” said Cozzi-Schmarr. She views the delicate little animals on her water farm as pets, saying some of them seem to recognize her touch. Hawaii’s sea-horse woman completed her graduate work at San Diego State University and had been raising shrimp in Latin America. In Ecuador she met and married fellow biologist Schmarr. For more than a decade, they watched helplessly as the pristine coastal areas along the Pacific Ocean and Gulf of Mexico were trampled, with more and more people moving in and fishing without regulation. “That’s what made us want to inspire others to care about the ocean environments,” she said. 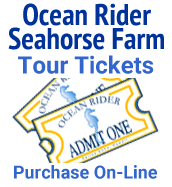 So, they moved to Hawaii and established Ocean Riders Seahorse Farm on the Kona Coast of Hawaii’s Big Island. The Natural Energy Laboratory of Hawaii Authority was the answer. The state-sponsored aquaculture facility offered a streamlined permit process and ready access to the cool, clear waters of the Pacific Ocean. The couple obtained a Small Business Administration loan and got to work on a 3-acre oceanside lot. Seven years later, their sea-horse farm is raising thousands of the endangered creatures, which live an average of eight years. The farm’s broods have a survival rate of up to 80 percent, compared with perhaps a 0.1 percent survival rate in the wild, Cozzi-Schmarr said. “People don’t believe they are real, but they just seem like they are so cool, so intelligent, so enchanting,” Cozzi-Schmarr said of a fascination that dates to childhood. “They have character. They don’t mind us touching them, and there seems to be some recognition there. They know when it’s time to eat, that’s for sure,” she said. Ranging from less than an inch to more than a foot long, sea horses have prehensile tails to hook onto underwater vegetation, protective bony plates in their skin, and a tubelike mouth for sucking in crustaceans. Cozzi-Schmarr is determined to use interest in sea horses to spread awareness of the human impact on ocean environments. “We need to start early to teach conservation to all children,” he said.